This article was originally published on the website of the College of Food, Agricultural, and Environmental Sciences and written by Kurt Knebusch. PERRYSBURG, Ohio — Seen coyotes near your home? Do deer eat your shrubs down to nubs? Get tips on what to do in a workshop led by wildlife experts Stan Gehrt and Marne Titchenell of The Ohio State University. 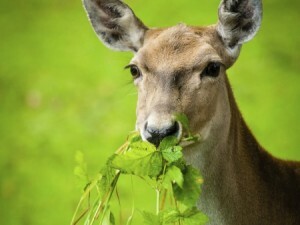 The Good, the Bad and the Hungry: Managing Wildlife Conflicts in Your Landscape is 9 a.m. to 3 p.m. Aug. 7 at the Wood County Park District’s W.W. Knight Nature Preserve, 29530 White Road in Perrysburg, near Toledo. Registration is $35, includes lunch and is needed by noon Aug. 3. Get details and a link to online registration and payment at go.osu.edu/08-07WildlifeWorkshop. An associate professor and Extension wildlife specialist, Gehrt has become widely known in the field of urban wildlife, especially for his research on Chicago’s coyotes. Two episodes of the PBS show “Nature” —“Raccoon Nation” and “Meet the Coywolf” — have featured his work. So have National Geographic, ABC News and dozens of other media outlets. Titchenell is a wildlife program specialist with interests in human-wildlife conflicts; managing wildlife habitat, including for birds and butterflies; and managing bats, frogs, toads, salamanders and other woodland wildlife. Gehrt and Titchenell both are in the School of Environment of Natural Resources in Ohio State’s College of Food, Agricultural, and Environmental Sciences. Workshop sessions will look at “tools for your toolbox” for managing wildlife conflicts and at specific animals including deer, rabbits, skunks, moles, voles, raccoons, woodchucks and Canada geese. A 90-minute afternoon session will focus exclusively on urban coyotes. A Q-and-A session will follow. The workshop’s host is the Ohio Woodland Stewards Program, part of the college’s statewide outreach arm,Ohio State University Extension.